Digital marketing channels have created new opportunities to fuel growth through connections with customers. But at the same time, many marketers are struggling to determine the best way to segment and target customers with the right offers while staying within budget and channel capacities. They also have to ensure overlapping campaigns don't cannibalize future sales or turn off customers with too many messages. This paper summarizes insights and best practices shared by SAS optimization expert Amartya Bhattacharjya and Hillary Ashton, the Director of Customer Intelligence for SAS, on a webinar produced by the AMA and sponsored by SAS. 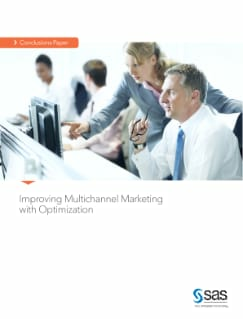 Together, they explore the limitations of traditional approaches to matching, explain how and why marketing optimization delivers significantly better outcomes, and the illustrate the kinds of benefits customers are realizing through optimization.